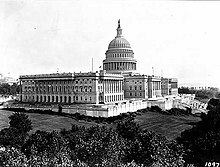 The Forty-ninth United States Congress was a meeting of the legislative branch of the United States federal government, consisting of the United States Senate and the United States House of Representatives. It met in Washington, D.C. from March 4, 1885, to March 4, 1887, during the first two years of Grover Cleveland's first presidency. 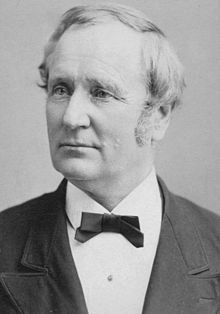 The apportionment of seats in the House of Representatives was based on the Tenth Census of the United States in 1880. The Senate had a Republican majority, and the House had a Democratic majority. 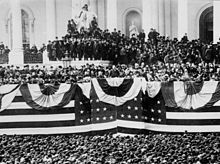 First presidential inauguration of Grover Cleveland, March 4, 1885, on the East Portico of the U.S. Capitol. "Fellow-Citizens: In the presence of this vast assemblage of my countrymen I am about to supplement and seal by the oath which I shall take the manifestation of the will of a great and free people…." Senators were elected by the state legislatures every two years, with one-third beginning new six-year terms with each Congress. Preceding the names in the list below are Senate class numbers, which indicate the cycle of their election. 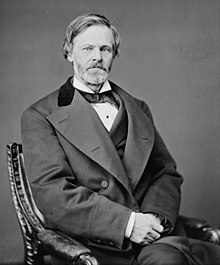 In this Congress, Class 1 meant their term ended with this Congress, requiring reelection in 1886; Class 2 meant their term began in the last Congress, requiring reelection in 1888; and Class 3 meant their term began in this Congress, requiring reelection in 1890. The names of members of the House of Representatives are listed by district. ^ "THE 25th PRESIDENTIAL INAUGURATION / Grover Cleveland / March 4, 1885". United States Congress Joint Committee on Inaugural Ceremonies. Congressional Directory for the 49th Congress, 1st Session. Congressional Directory for the 49th Congress, 1st Session (1st Revision). Congressional Directory for the 49th Congress, 1st Session (2nd Revision). Congressional Directory for the 49th Congress, 2nd Session. Congressional Directory for the 49th Congress, 2nd Session (Revision).